Hindered Settling has a nice post showing changes in Peru’s Ucayali River over time. It was created by animating a series of Landsat images which were captured from 1985 through 2013. The proliferation of aerial photography and satellite imagery has made visualizing changes relatively easy. Older studies are more difficult because of the rarity of aerial data. I was fortunate to find black and white plates for Harris County when I was working on my dissertation. I had to scan the images and georeference them myself before I could use them in my study of long-term urban growth. Without these, I would have been stuck with only two points in time, both of which occurred after the early ’80s. Being from 1945, the older plates provided a crucial reference point which helped validate my methodology for quantifying anthropomorphic change. That’s what makes the Fisk plates so amazing to me. 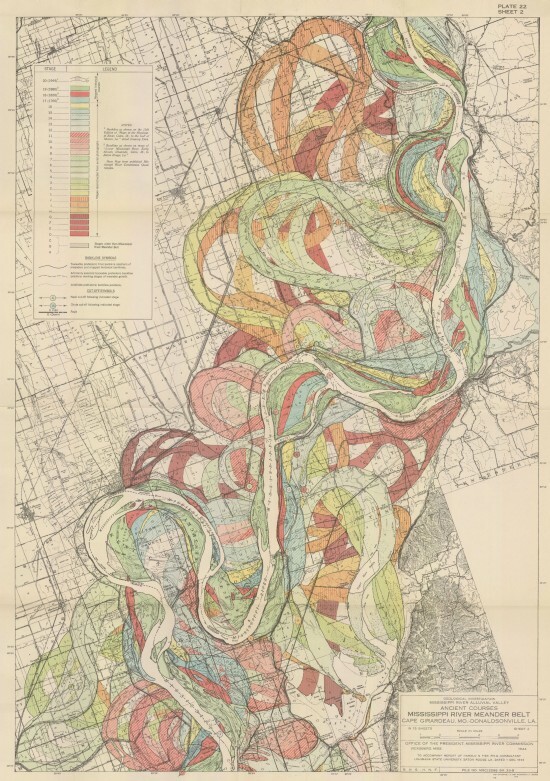 Fisk used survey methods to establish the ancient river bed locations for the lower Mississippi River. The results are still astounding 72 years later. This is cartography at its finest! Who says you need GIS to make excellent maps? Ebola Leaps to the U.S.